Esraa Abdel Fattah, better known as the Tahrir Square “Facebook Girl”, has been named one of Glamour Magazine’s Women of the Year. 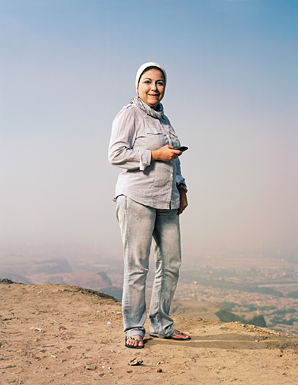 “In January 25, a young Egyptian woman known as Facebook Girl tucked her hair under a head scarf, pocketed her cell phone and met up with 20 other young people to march toward the center of Cairo. Soon hundreds, then thousands of others joined them, until 10,000-strong, they surged into Tahrir Square to make history. Entry filed under: Uncategorized. Tags: africa, Cairo, developing world, development, egypt, Esraa Abdel Fattah, Facebook, Facebook Girl, Glamour, Glamour Magazine, Glamour Magazine Women of the Year, Helping Women Helps the World, social media, Tahrir Square, women, women's rights.